While brainstorming and writing a proposal for a device to detect pediatric tuberculosis has been extremely valuable, we recognize the challenge of developing our devices as undergraduate/graduate students. 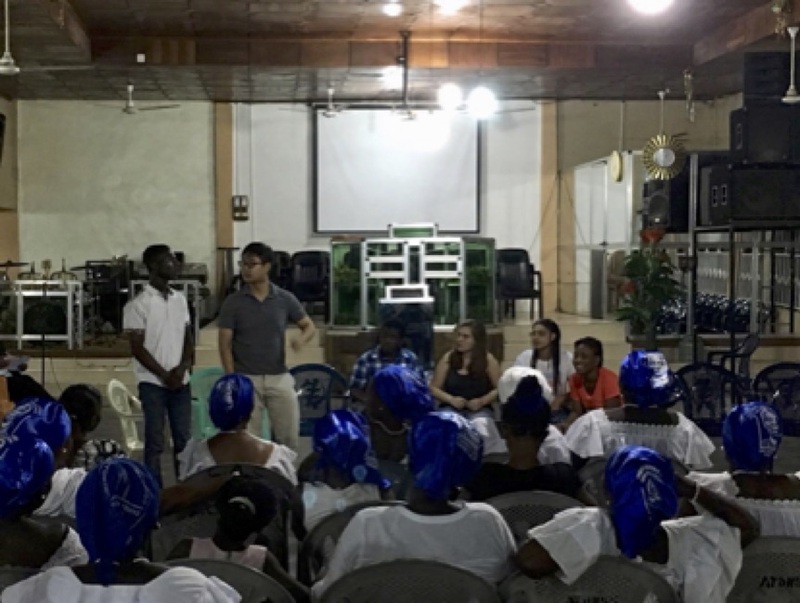 This acknowledgement led us to try to identify a healthcare problem in Ghana and to come up with a solution that undergraduates could potentially pursue. The process began after we arrived in Ghana, with each student independently identifying a problem and brainstorming a solution. Next, we played an entrepreneurial game, in which each student gave a pitch for an idea, and everyone gave hypothetical money to his or her favorite idea. The ideas with the most hypothetical monetary investments would move on to the next round. After two rounds of pitches, we narrowed our list down to two ideas: Big Data and the Multi-Cot. Splitting up our group between the two ideas, we then prepared a presentation to give to Kumasi Center for Collaborative Research in Tropical Medicine (KCCR) researchers. Yesterday and today, we present the summaries of our ideas. The Multi-Cot aims to tackle the issue of limited space in large regional hospitals within Ghana and other similar situations of overcrowding. 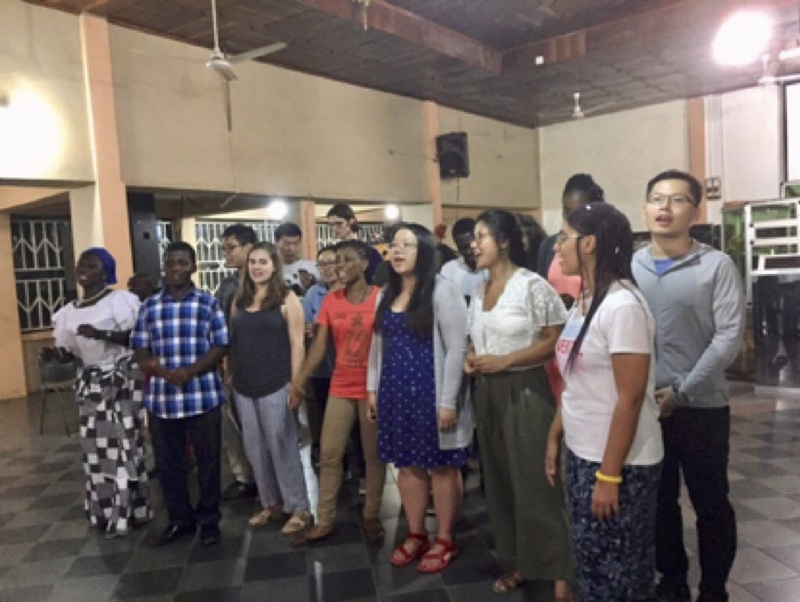 Throughout our time in Ghana, we had the opportunity to visit many hospitals and smaller health clinics. While visiting Komfo Anokye Teaching Hospital (KATH) in Kumasi, Ghana, we noticed that there was a poster on a pediatrician’s wall for the “One Baby One Cot” initiative. We soon learned that there is very limited space per patient at the large regional hospitals — certainly not enough space for each individual baby to occupy his or her own cot. For example, in some hospitals, there can be up to eight babies in one cot! This can be problematic when trying to prevent the spread of infection but also difficult for mothers who have little to no space to watch over their newborns when they stay at the hospital to breastfeed. 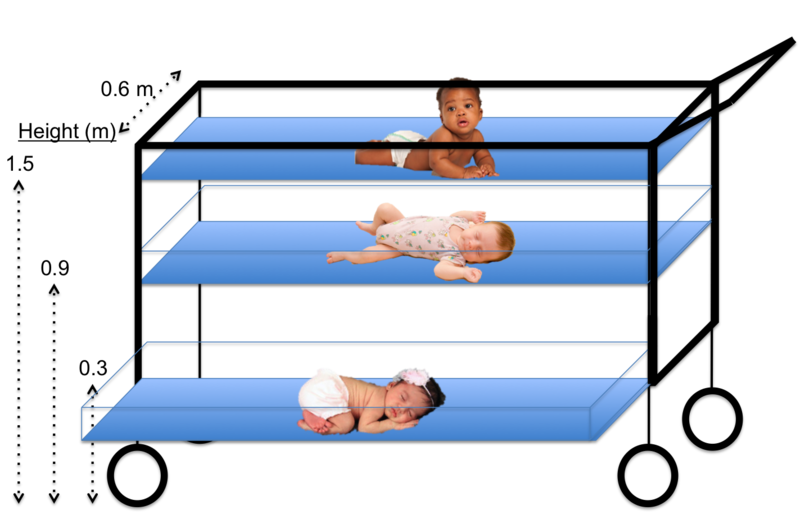 There are several implications of having multiple babies in a single cot that we would like to address. First, the risk of hospital-acquired infections greatly increases because of the close contact of the babies. This close contact also makes it difficult for nurses and caretakers to monitor each baby. In addition, many babies may need to be transported to other hospitals because of a lack of bed space, moving the patients and their caretakers farther from home. 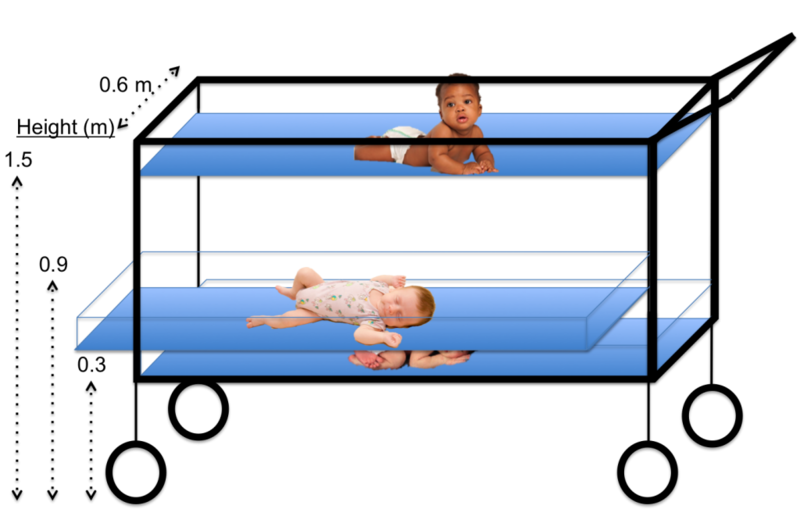 The horizontal sliding mechanism of the Multi-Cot allows each newborn to be safely removed from the structure, regardless of the cot level. 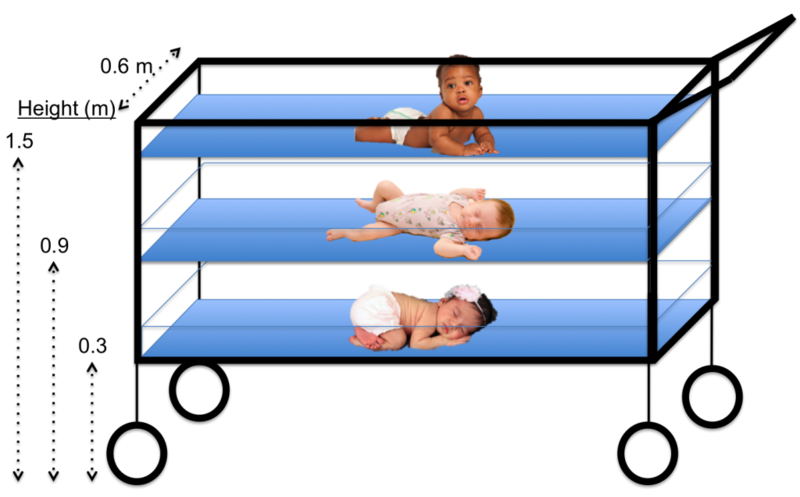 After learning about this problem, we began thinking of ways to decrease the complications associated with having multiple newborns in one cot. During the brainstorming session, the key element that led to our solution was actually how we view the problem. We started to see the issue as a lack of horizontal space – meaning the inability to add more cots horizontally without physically expanding the newborn ward. If expanding the horizontal space is not possible, then why not try to make better use of the vertical space that is already available? This concept of vertical space led us to the idea of the Multi-Cot, which involves three smaller newborn cots stacked vertically, with space between each cot to provide proper airflow. With clear plastic sides and an open top, each baby would be easily seen from every direction. Finally, to ensure safety when removing newborns from the lower levels, we added a sliding mechanism to our design to allow the lower cots to slide horizontally and eliminate any vertical obstructions when picking up the baby. As we anticipate developing the Multi-Cot, we must consider multiple factors. Our main consideration is safety, which includes the Multi-Cot’s stability, the visibility of every child, and the ability to be sanitized. Other factors to be considered include the cost, as well as the ease of physical construction and dismantling; however, we would address these details later in the design process. While brainstorming and writing a proposal for a device to detect pediatric tuberculosis has been extremely valuable, we recognize the challenge of developing our devices as undergraduate/graduate students. This acknowledgement led us to try to identify a healthcare problem in Ghana and to come up with a solution that undergraduates could potentially pursue. The process began after we arrived in Ghana, with each student independently identifying a problem and brainstorming a solution. Next, we played an entrepreneurial game, in which each student gave a pitch for an idea, and everyone gave hypothetical money to his or her favorite idea. The ideas with the most hypothetical monetary investments would move on to the next round. After two rounds of pitches, we narrowed our list down to two ideas: Big Data and the Multi-Cot. Splitting up our group between the two ideas, we then prepared a presentation to give to Kumasi Center for Collaborative Research in Tropical Medicine (KCCR) researchers. Today and Friday we present the summaries of our ideas. Our goal was to think of a project that a team of undergraduates at Penn could complete in one year to produce something of value to KCCR in the scope of Ghanaian healthcare. 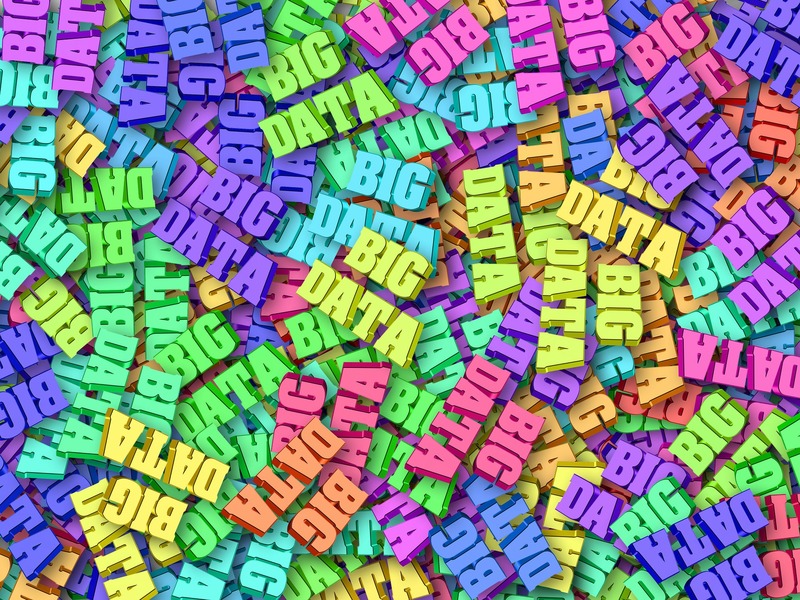 We turned our attention toward big data science and the difficulties in tuberculosis diagnosis. One of the difficulties identified was the lack of diagnostic tools in more remote arms of the healthcare system. This lack leads to unnecessary and numerous referrals to larger care centers, inconveniencing the patient and placing a burden on the efficiency of the healthcare system. Specifically, the only standard-of-care diagnostic ubiquitous throughout all clinics was patient-reported symptoms — the most notable of which is prolonged coughing. Moreover, this symptom can often be confused with asthma or pneumonia. However, asthma involves bronchial constriction, and TB and pneumonia have different sputum distribution profiles. We theorized that this difference would correlate with differentiated sound profiles for patient coughs or baseline breathing and, subsequently, measurable biomarkers. The idea proposed was that, if blind data could be collected from KCCR with sound recordings of patients coughing and breathing, along with their demographics and final diagnoses, then analyses could be run to produce an algorithm capable of differentiating between each cough or breath. This algorithm could then be extended to a phone app that could be used to more empirically diagnose patients in any setting and increase overall healthcare efficiency. Current devices that detect Mycobacterium tuberculosis include chest X-ray, smear microscopy, and GeneXpert. Although the combination of these techniques can lead to a proper diagnosis for adults, there are three main limitations of their use: (1) necessary infrastructure; (2) required sputum samples; and (3) time. First, many clinics in rural Ghana do not currently have the infrastructure or electricity sources to support these machines. Second, both smear microscopy and the GeneXpert rely on analyzing sputum samples (bacteria-containing phlegm), but children have difficulty providing sufficient samples. Finally, since sputum samples are best taken in the morning, these techniques often require patients to go home and return the next day to provide a sample. Since all biological molecules are inherently non-magnetic, these magnetic nanoparticles can be attached to ManLAM using aptamers to allow for detection by the spin-valve sensor. 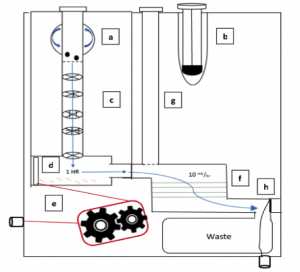 To address these limitations in our own design, we proposed a diagnostic device that does not require electricity, relies on a urine sample instead of a sputum sample, and is anticipated to take one hour to obtain a diagnosis. By incorporating these three characteristics, we propose a device that can be used to more easily diagnose children during their first initial visit at any healthcare facility in Ghana. 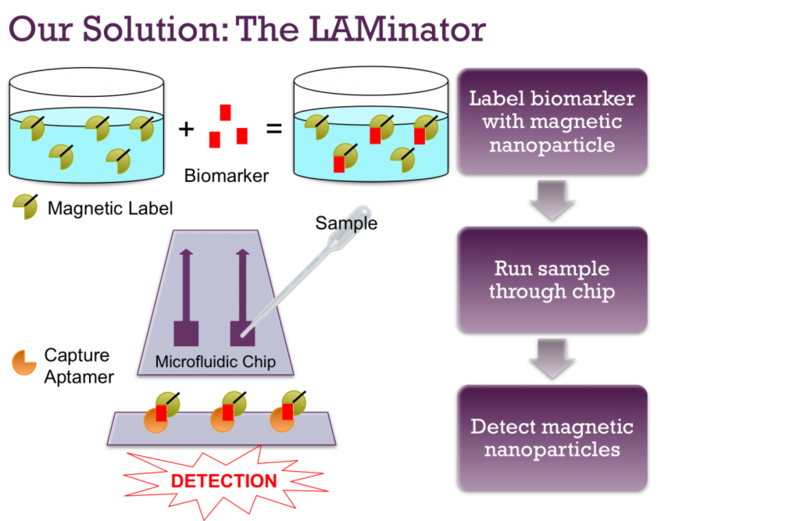 This overview of our device shows how the biomarker will be magnetically labeled, pushed through microfluidic channels, captured on the surface, and detected by the spin-valve sensor. After doing a literature search of publications on pediatric tuberculosis, we learned that M. tuberculosis sheds a glycolipid called lipoarabinomannan (ManLAM) that is excreted in the urine. Therefore, ManLAM is the biomarker we hope to detect. Next, after learning that biology is inherently nonmagnetic, we figured that we could detect ManLAM specifically and sensitively if we could label it magnetically. 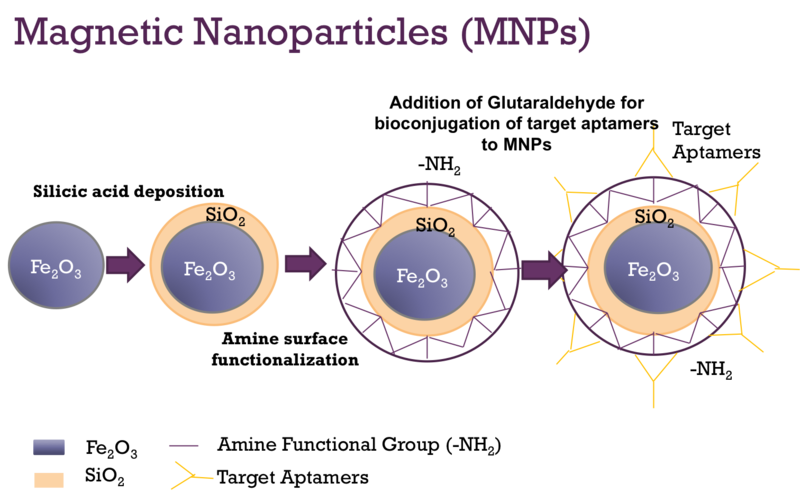 Our proposed design does this labeling by adding magnetic nanoparticles (MNPs) to the ManLAM. This magnetic labeling involves aptamers, which are synthetic oligonucleotides that can be created to bind to a specific target. By combining the MNPs with aptamers that bind only to ManLAM, we can ultimately give the urine biomarker a magnetic property. 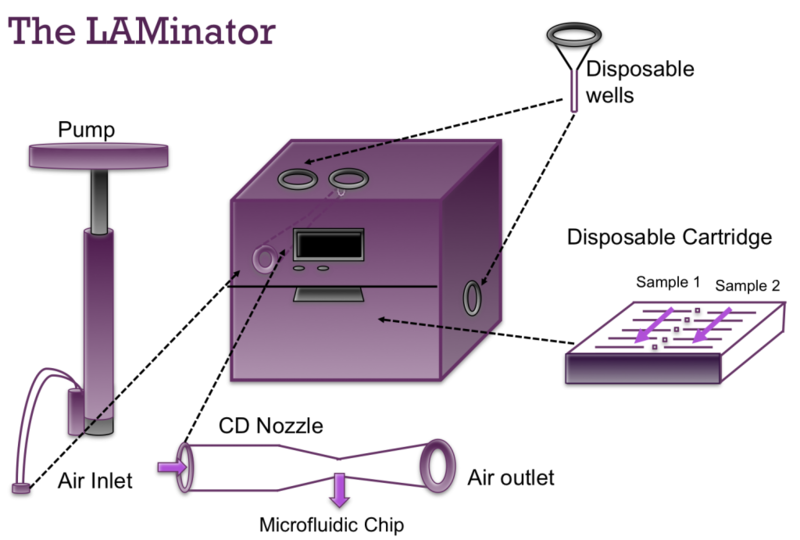 The LAMinator has a reusable box component to house the electronics as well as a disposable cartridge to hold the microfluidic chip and disposable wells to avoid sample contamination. Therefore, the first step of our device is treating the urine sample with the custom aptamer-bound MNPs. 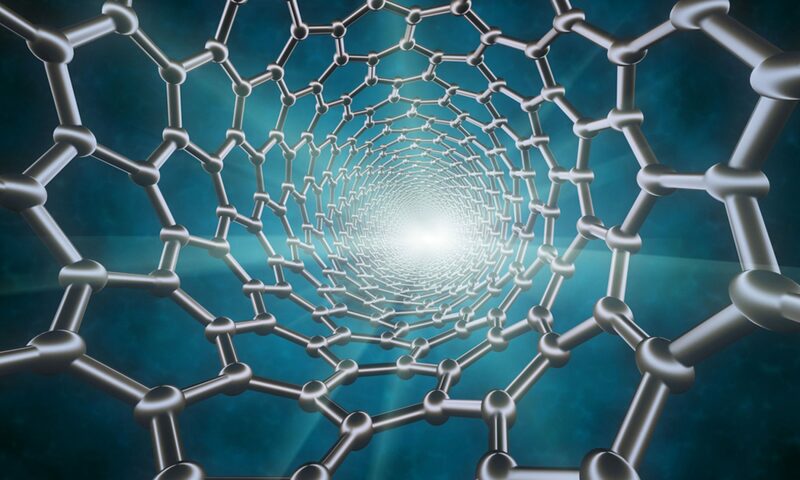 The electronic components of our diagnostic device consist of specialized sensors, called spin-valve sensors, that can detect the presence of magnetic particles. Small fluid channels containing the urine sample traverse the surface of these sensors. If ManLAM is present in the urine as it passes by the spin-valve sensors, the surface-bound aptamers bind to the magnetically labeled ManLAM and capture them on the surface. The presence of these magnetic particles activates the spin-valve sensors and produces a change in voltage that can be detected by computer-like microprocessors. If ManLAM is not in the sample, then nothing will bind to the capture aptamers and no TB will be detected. 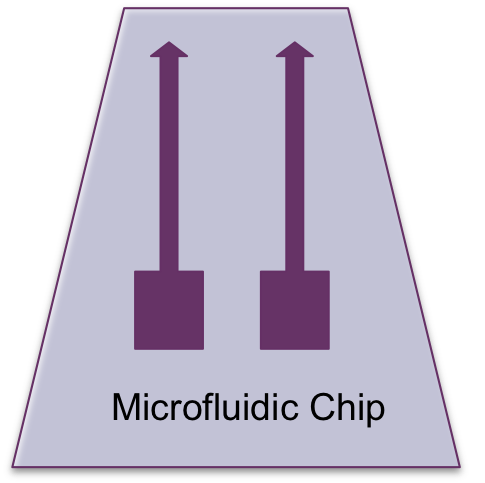 The microfluidic chip design has two channels to allow for two urine samples to be analyzed at the same time. We would like to thank Penn Engineering and everyone who has helped to make this program possible. 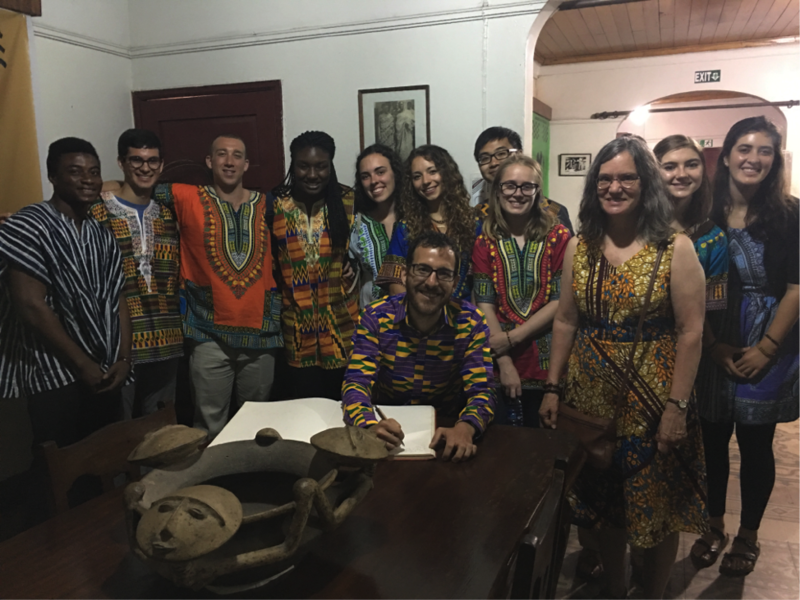 As you can see from our blog posts, our time in the classroom and the month in Ghana have been an unforgettable academic and cultural experience. The APOC program has been an amazing opportunity to get out of our comfort zones and to see the potential of engineering solutions in the world around us. 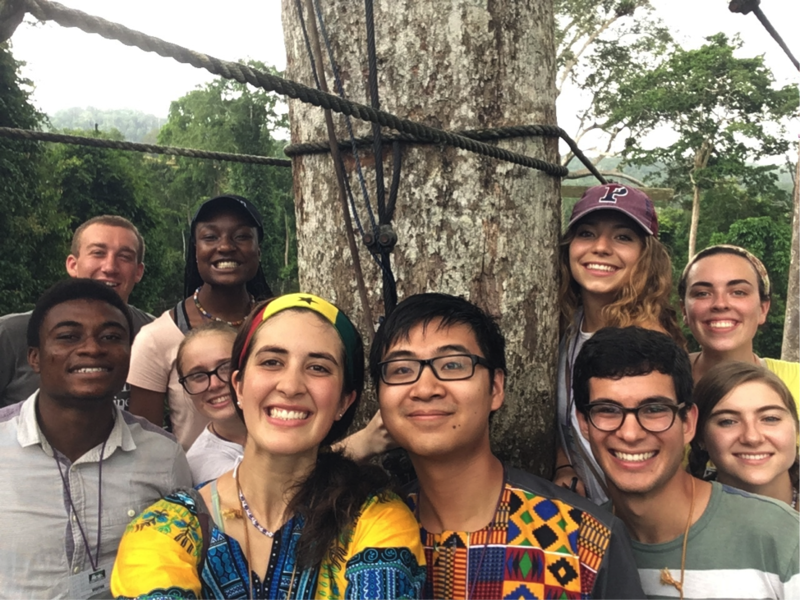 One of our favorite memories was visiting King Otumfuo Nana Osei Tutu II of the Asante region (left to right: Salim, Jason Grosz, David Pontoriero, Kaila Helm, Hope McMahon, Dr. David Issadore, Danielle Tsougarakis, Ethan Zhao, Kathleen Givan, Dr. Miriam Wattenbarger, Katharine Cocherl, Kate Panzer). 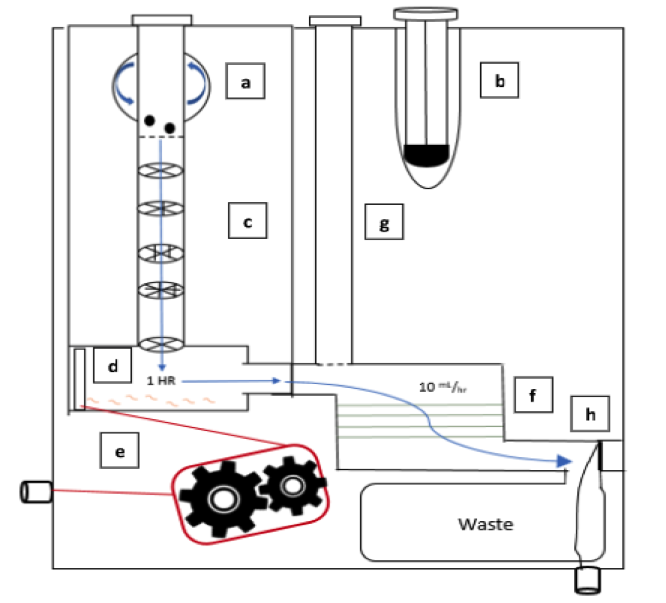 David Issadore, a faculty member in the Department of Bioengineering at the University of Pennsylvania teaches an engineering course ENGR566 – Appropriate Point of Care Diagnostics. 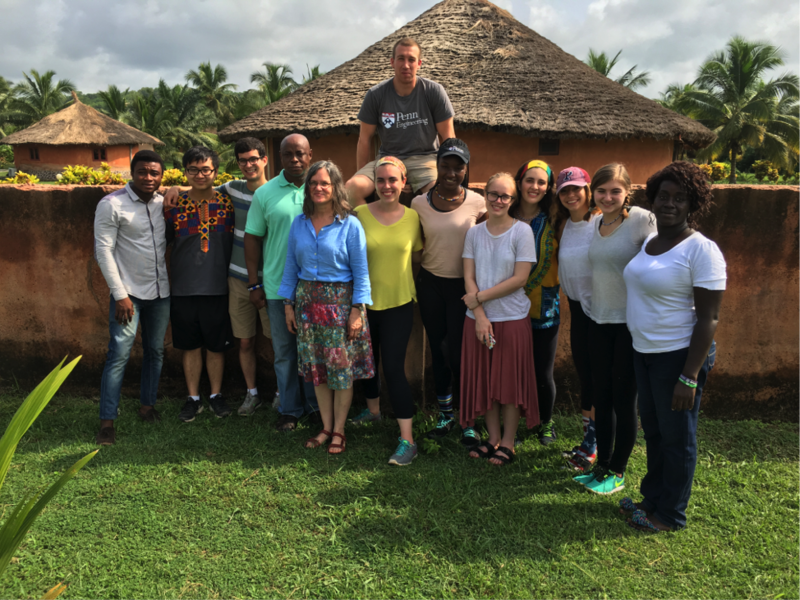 As part of this course, he and Miriam Wattenberger from CBE, have taken nine Penn students, most of them majoring in Bioengineering, to Kumasi, Ghana, to study the diagnosis of pediatric tuberculosis. While in Ghana, these students are blogging daily on their experiences. As we woke up early to prepare for the nine-hour flight ahead of us, we all acknowledged that time really does fly. Arriving at the Accra airport, we had to say goodbye to our Ghanaian friends Salim, Uncle Ebo, and Nana Yaa. The month has come and gone. It feels like the trip went quickly, but we have learned so much and gained many valuable experiences along the way. From our hospital and clinic visits, to our interactions with an herbalist and a fetish priestess, we were exposed to many healthcare settings found in Ghana. We had the opportunity to present our pediatric tuberculosis diagnostic ideas to a room filled with researchers and clinicians, getting invaluable feedback from multiple experts. 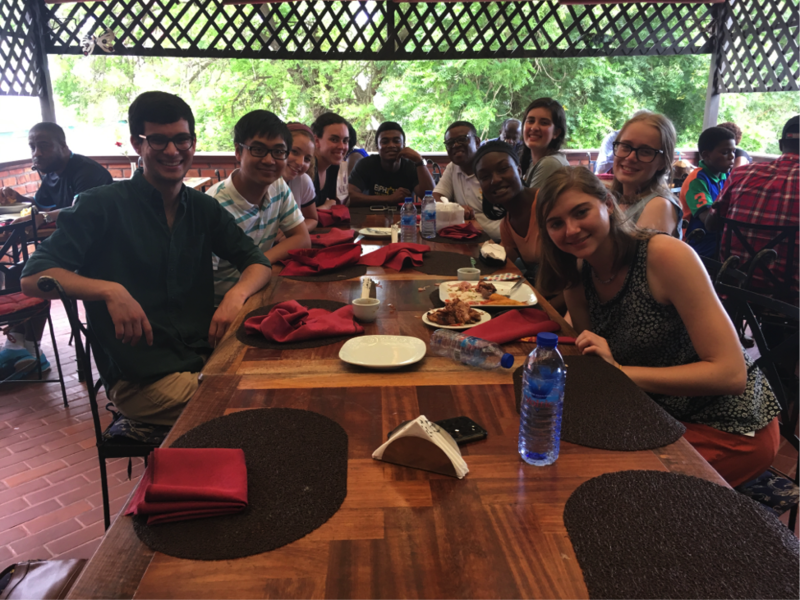 Along with our academic pursuits, we also got to explore the Ghanaian culture and learn about customs, traditions, food, and much more. We met many friendly people along the way. These aspects are the memories that we will remember for years to come. As we move beyond this course, we are excited to continue pursuing our interests in biomedical diagnostics and problem solving that can be applied globally. We would like to thank everyone who helped make this unforgettable experience possible. 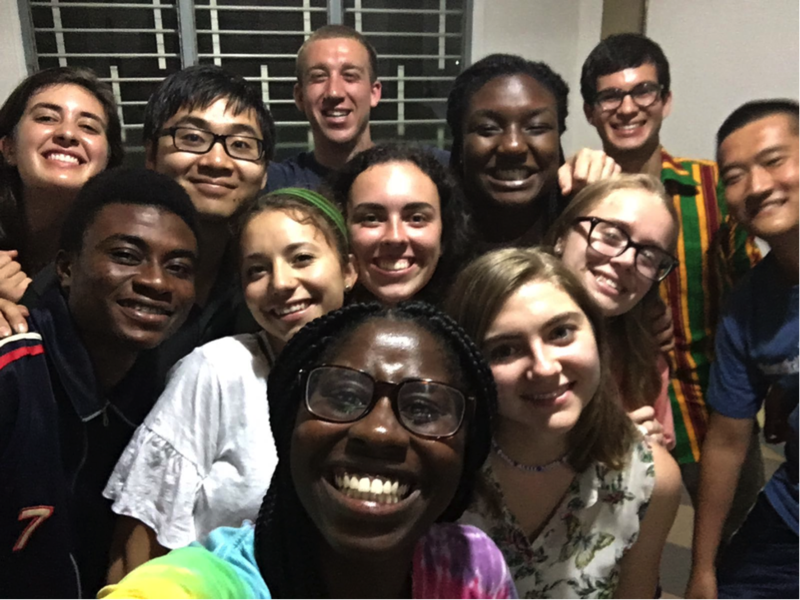 Students enjoy their last dinner in Ghana at Buka, a Ghanaian and Nigerian restaurant in Accra (left to right: Jason Grosz, Ethan Zhao, Danielle Tsougarakis, Hope McMahon, Salim, Uncle Ebo, Kaila Helm, Kate Panzer, Katharine Cocherl, Kathleen Givan). Today marked our last full day in Ghana. In the morning, we set off rather early to start our day in Accra. But first, we had to drop one of our students, Dave, at the airport so he could make his way to Rwanda to visit a college friend. As we traveled to the airport, we had the opportunity to get a better picture of what life is like in Ghana’s capital. It was nice to go back to Accra and see how different it was from Kumasi. It is a much larger city, with various government buildings, people walking about, and large advertising signs every few yards. Kwame Nkrumah stands with past Vice Provost Roy Nichols in front of the Benjamin Franklin statue on College Green. Our first stop was the Kwame Nkrumah Memorial Park. Kwame Nkrumah was the first president of Ghana when the country gained independence in 1957. Interestingly, he went to Penn to earn a Master of Arts in philosophy and a Master of Science in education. The mausoleum in Accra contains his and his wife’s bodies. It is surrounded by various water fountains, which are a symbol of life to provide a sense of immortality for Nkrumah. 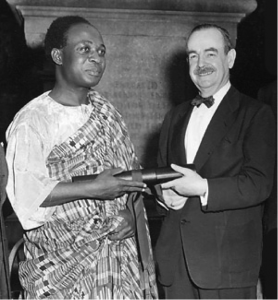 Many Ghanaians want to continue the work that Nkrumah did not get to finish by helping Ghana to continue developing as an independent country. In addition, there is a museum that contains many of his clothes and pictures of him as he met with various world leaders. We even saw a picture of him on Penn’s campus, shaking the hand of then Vice Provost Roy Nichols. After the tour, we met Dr. Ellis from KCCR for lunch at a nice open-air restaurant, called Buka. Many of us stuck to our favorites of chicken and fried plantains, but some ventured out to try guinea fowl and snails. After lunch, we walked around the area to some nearby vendors, where we were able to shop for last minute gifts. We soon realized how much more expensive Accra was, compared to Kumasi. We headed back to the hotel to relax a bit before dinner. For our last night in Ghana, we went out to a restaurant that had a live jazz band. We had our last taste of Ghanaian cuisine and had fun dancing to highlife music. Highlife is a genre of music that we only recently learned is popular in both Ghana and Nigeria. To end our last night in Ghana, we headed back to the hotel. After spending some time to prepare, we huddled in the hotel’s lobby for our talent show, and as night turned into morning, we reluctantly headed to our rooms to finish packing for our early departure. 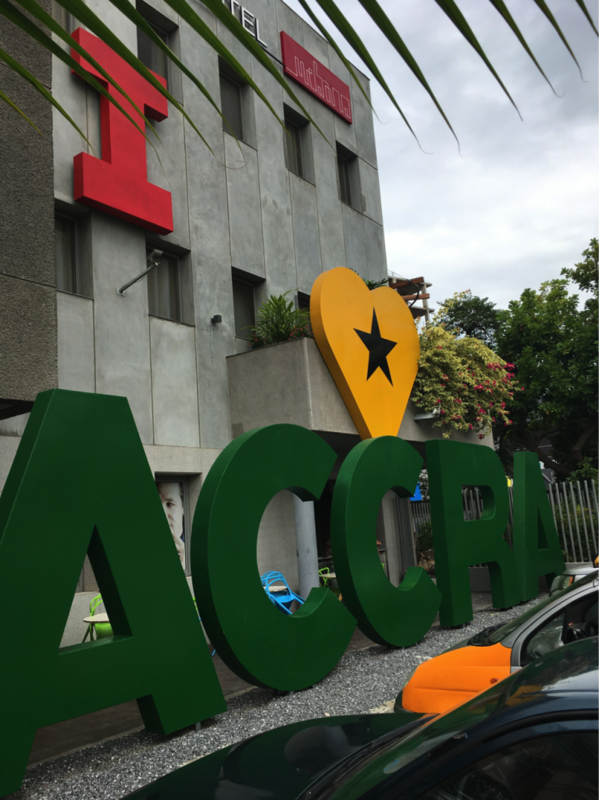 The APOC program began and ended in Accra, the capital of Ghana. The APOC team poses in front of the rooms at Coconut Grove, resembling huts on the outside and furnished with beds and a bathroom on the inside (left to right: Salim, Ethan Zhao, Jason Grosz, Dr. Ocek Eke, Dr. Miriam Wattenbarger, Hope McMahon, David Pontoriero, Kaila Helm, Kathleen Givan, Kate Panzer, Danielle Tsougarakis, Katharine Cocherl, Nana Yaa). Today was the second day that we spent in the coastal city of Cape Coast. Many of us woke up earlier than usual to walk along the beach and explore the resort. While walking along the beach, we noticed large rowboats in the distance that were anchored to the shore by ropes. We originally thought that they were fishing boats, but it turned out that they were digging up sand from the ocean floor to restore sand erosion on the beach. 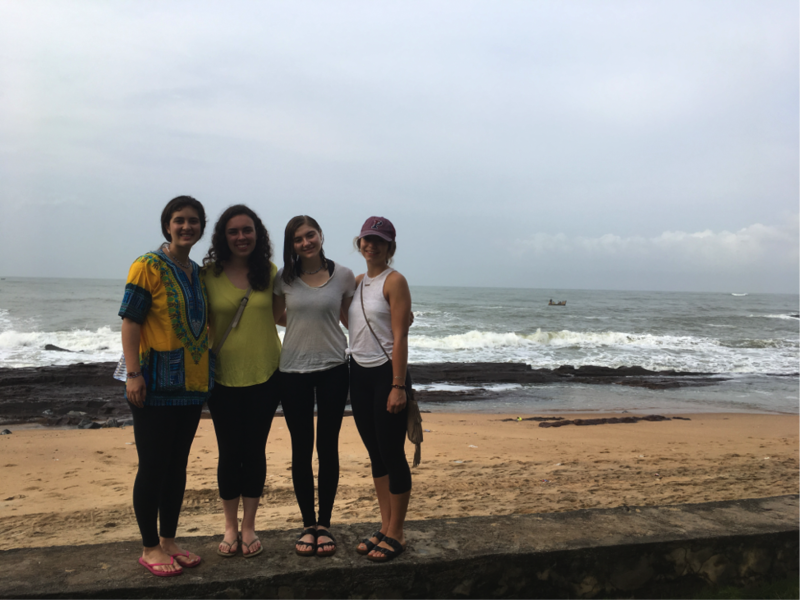 Students (left to right) Kate Panzer, Hope McMahon, Katharine Cocherl, and Danielle Tsougarakis stand along the beachfront of Coconut Grove in Cape Coast, with the Atlantic Ocean in the background. After breakfast, we traveled outside of Cape Coast to Kakum National Park, which is a dense tropical rainforest on the coast that is home to many wildlife species, including monkeys, leopards, elephants, and antelope. It is also the home of one of Africa’s largest canopy walkways, consisting of rope suspension bridges more than one hundred feet above the forest floor. The views from the bridges were amazing, as we could see for miles across the tops of the rainforest trees. While we were on the bridges, it started drizzling, which was refreshing given the heat. After leaving Kakum National Park, we drove back to Accra, the capital of Ghana, where we will stay for the remainder of our trip. A Portuguese church found in the center of the Elmina Slave Castle. Today, we said goodbye to our Kumasi friends and left the Ashanti region for the final leg of our trip. After our bonus night in the new student hostel (dormitory), we boarded the KNUST bus for a six-hour road trip to Cape Coast. The drive was pleasant, and the scenery became more coastal as we continued. 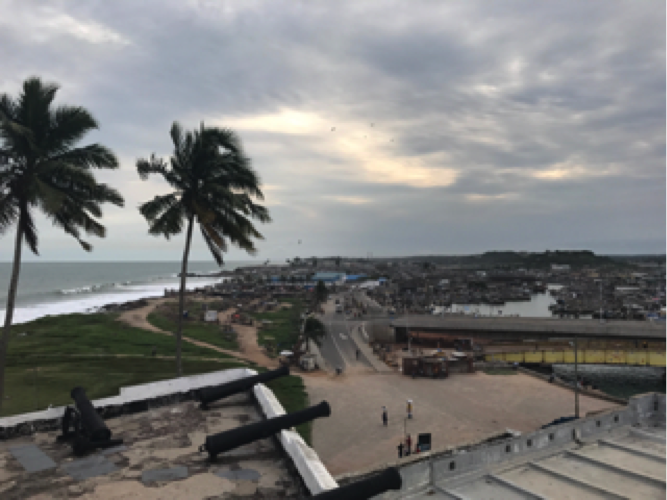 Most people slept through it, but once the ocean became visible, everyone woke up in excitement because we knew we were getting close to Elmina, a beach town just west of Cape Coast. As we drove through the town, we noticed that it resembled many of the beach towns back home. Our driver, Uncle Ebo, then parked in front of an enormous white castle. It was located on the edge of a peninsula, with a narrow beach to its left and crashing waves to its right. It had cannons situated all along its upper levels and a bustling group of locals hanging out in front of its entrance. It was the Elmina Slave Castle, also known as St. George’s Castle, and the team started to prepare for the tour. 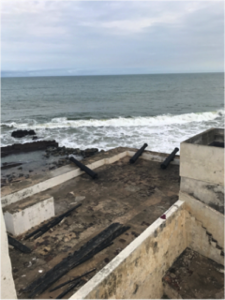 Cannons are found on the perimeter of the Elmina Slave Castle, which point out toward the Atlantic Ocean. As we entered the castle, the mood became somber. 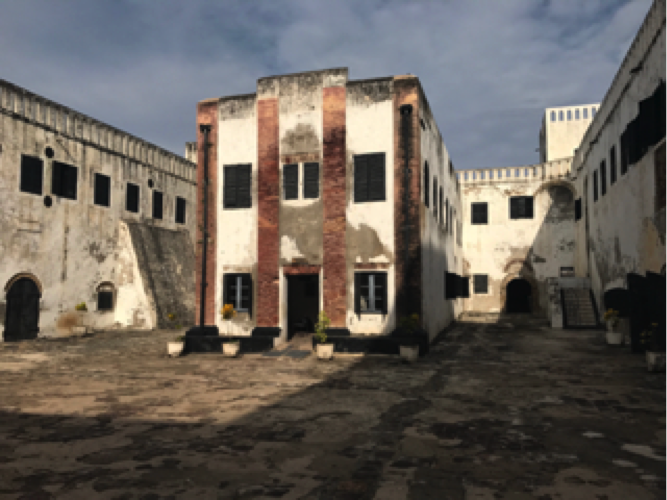 A tour guide provided us with a background of the building, which was a Dutch fort used over the years to facilitate the sale and transport of people from Ghana and the surrounding countries during the slave trade. The first portion of the tour followed the path of a slave during their internment, beginning with the female quarters, then the courtyards used for public punishment, the male quarters, punishment cells, and lastly the final exit where people were loaded onto the ships for their journey across the Atlantic. It was a grim tour to take, and the guide shared some incredibly harrowing stories throughout. The second portion of the tour focused more on other aspects of the fort. Once we loaded back onto the bus, the team reflected on the experience we had at Elmina Castle as we drove away. After a half-hour drive, we soon arrived to our new rooms at a local beachfront resort called Coconut Grove. Its beautiful facility included a private beach, an ocean-facing restaurant/bar, beachfront swings, a golf course, horse stables, and a crocodile pond (with ~10 real crocodiles!). We went out to a local restaurant with live music, danced a bit, then headed home to enjoy the amenities during one of our last nights together as a team. The breathtaking view of Elmina, a beach town on the coast of Ghana near Cape Coast. 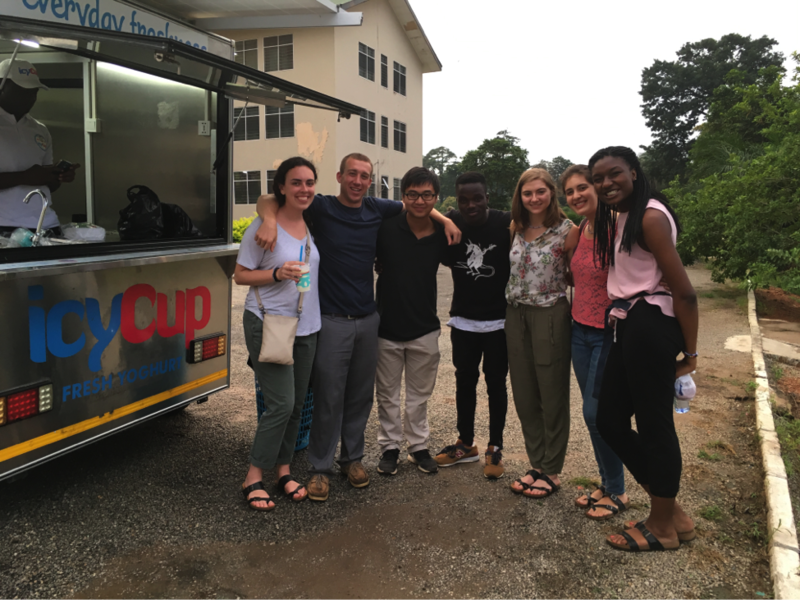 Our last trip to Icy Cup, a yogurt food truck and shop chain that can be found scattered across campus and in other major commercial areas in Kumasi (left to right: Hope McMahon, David Pontoriero, Ethan Zhao, Martin, Katharine Cocherl, Kate Panzer, Kaila Helm). This morning, we found out that we would be spending our last night in Kumasi in a hostel, which is equivalent to a dormitory at a U.S. college. We packed our belongings and moved into a hostel called “Complex Brunei,” which is an apartment-style dorm for upperclassmen, each room furnished with three beds, a closet, a full bathroom, and a table. We were all excited to get the student experience of staying in a hostel and compare it to the visitor housing at the KCCR guesthouse. In the afternoon, we had the opportunity to visit the international community school (ICS), a high school founded on the philosophy of bringing competitive, Western-inspired education to Kumasi. A friend of our team member Dave currently works at ICS and suggested we come speak to the prospective college students at the school. That being said, we gave a presentation on how the college application process works in the United States to a group of 10th and 12th graders. After our brief overview, we split into small groups and answered individual questions students had regarding different types of universities, SAT/ACT scores, the importance of a strong essay, and other application essentials. Speaking with the prospective students here and motivating them to apply to American universities was a great experience. Sharing our own college application processes and stories with the students was a fun and engaging way to fuel their academic aspirations. After our well-received presentation, the whole team left feeling accomplished. For our last night in Kumasi, we spent quality bonding time with our new friends Seun (Pittsburgh) and Tim (Michigan) and said our goodbyes. For dinner, we had a special surprise outing to a nearby Chinese restaurant, where we shared many different dishes and passed them around on a rotating glass platform. For some of the Ghanaians, this was their first time trying Chinese food, so it was fun to hear their reviews of all the dishes. Upon returning to campus, we continued our beloved tradition of team bonding by playing the Noun Game and card games.